A few weeks ago, I was able to break away and travel south to Oklahoma to visit my family. It was much needed and filled with lounging by the pool, giggling with my two younger sisters, drinking early morning coffee with my mother, making the best roasted tomato and avocado salsa with my brother, making smores with peanut butter and chocolate (omg) over a backyard bonfire, learning the art of cupcakery from my talented youngest sister, and harvesting a metric poop ton of produce from the GREAT GARDEN. My stepdad has more hobbies than you can shake a stick at. He is also one of the most talented individuals I have known. His latest hobbies include organic gardener/farmer and bee keeper extraordinaire! He has planted a bajillion plants, including okra, heirloom tomatoes, cherry tomatoes, yellow tomatoes, tomato tomatoes (did I mention tomatoes yet? ), green beans, squash, zucchini, tomatillos, bush beans, bell peppers, raspberries, fruit trees, blackberries, asparagus, onions, chard, herbs, and so on and so on and I know I’m missing some. They have the space (10+ acres) and use it! I’m super impressed. But being able to grow a huuuuge garden is the big thing that I miss about having a yard that is bigger than a postage stamp. While out there, I gathered several pounds of okra and tomatillos since I am not growing them at my place. Most of my northern friends, grew up never eating okra. Mmmmm. At restaurants in Oklahoma, fried okra is more popular than french fries. So good. But there are more ways to eat okra than just deep fried *gasp*. I know…why change a good thing. My regular okra dish that I whip up is stewed okra and tomatoes! 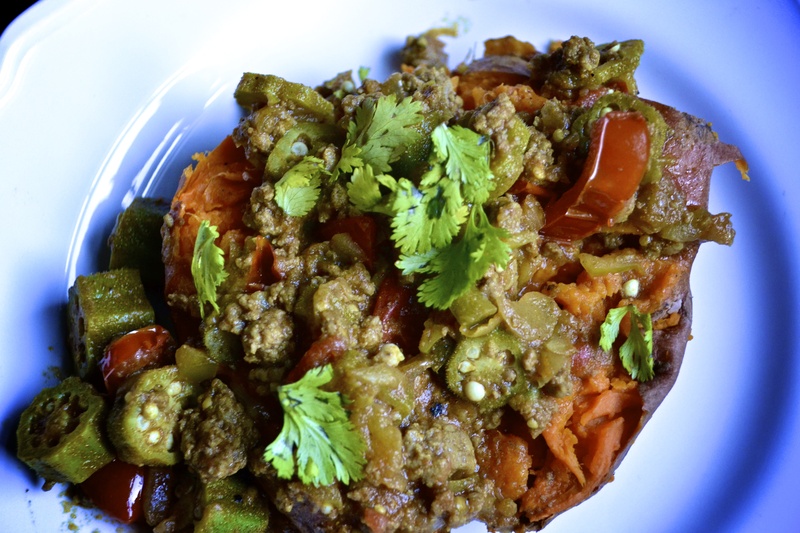 I was inspired by a Food&Wine recipe that added tomatillos instead of tomatoes. I went a little further, making this a one pot meal and added ground beef and more curry. 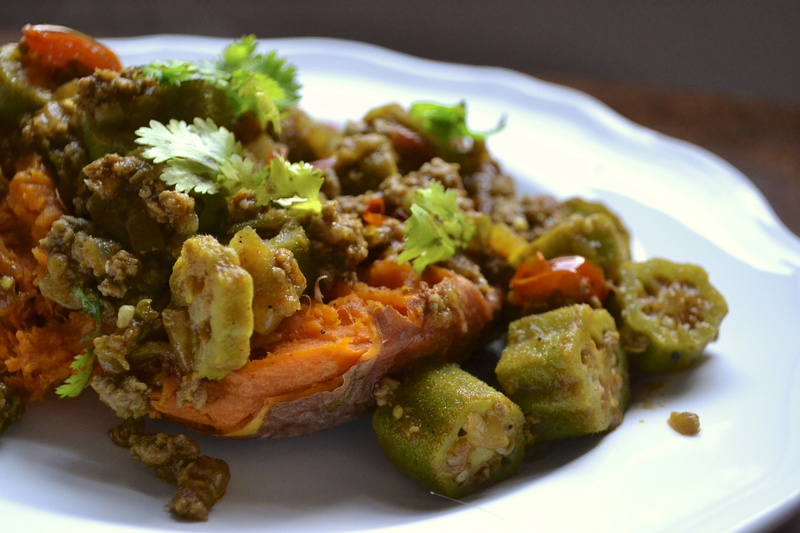 The tomatillos give it a nice tang and the curry provide a lot of flavor and heat. You can usually find tomatillos in the hispanic section of most grocery stores. Tomatoes can be subbed for the tomatillos. You can also leave out the ground beef for a vegetarian meal or side dish. Just reduce the spices, tomato paste, and water by half. Serve over rice or over a baked sweet potato. *Note – if you do not have access to tomatillos, replace with diced fresh tomatoes or a can of diced or crushed tomatoes. Heat the oil over medium heat in a large skillet or pot. Add the diced onion, jalapeno, turmeric, ginger, garam masala, and curry powder and cook over moderate heat for 3 to 5 minutes. Add the ground beef and cook until no pink remains, breaking into pieces. Add the okra and tomatillos and cook over moderately high heat, stirring, until browned and beginning to soften, about 5 minutes. Stir in the tomatoes, tomato paste, salt, and water and simmer over low heat until the okra is tender. Remove from heat. Stir in the lemon juice and 2 tablespoons of cilantro. Sprinkle the remaining 2 tablespoons of cilantro on top. Serve.